By careful quality control, tea pull out the original taste, creation was formulated as is also preferred to drink in any season refined tea. Decoction is fast, is a taste attractive timeless to drink many times. Carefully selected, especially steamed tea finish in a triangular tea pack, is a delicious drink tea in hot even in ice. Animation of electromagnetic gun of Certain Magical-phrase science has become a familiar character "Shomoe teacher" of cute original package, we have sold as a regional development-related goods shall be deemed to be replaced municipality. House of sweets "Emilie Floge"
In Patisserie of 1980 founding, financier, which boasts the popular from opening initially. Use a carefully selected almond and butter, the rich taste. Plain, chocolate, there are three kinds of taste of green tea. Use the local Tachikawa of eggs "Good akadama egg". Quality of vanilla and orange peel, the zest of lemon, and you will sweets baked in lightly refreshing flavor. I am a motif lighting in the form of angel of wheel of House of sweets "Emilie Floge". Use the brown rice and Tachikawa Good egg of attention as a healthy diet, it is a healthy snack that does not fried in oil. Aroma of brown rice flour roasted depth to the vanilla flavor is characterized. Your voice over than Ochiai shopkeeper Tachikawa located in Nishiki-cho, the day before yesterday closed the long-established Japanese confectionery shop "Yanase" is there took over the recipe. Developed as close as possible killing of Seto of Udo pie, it has become a commodity to get even willing to customers was a fan of Yanase. To Dorayaki using Tachikawa Iseya confectionery proud of homemade jam, is a commodity you press the favorite face of the mascot "ribbid thickness" of a heroine, "Misaka Mikoto" of electromagnetic gun of science and animation in the brand. We are pleased to souvenir of everyone of the phrase fans nationwide. Was named in honor of that five differences road is often in the city strategic points. Big chestnut has entered purring, it is handmade one by one craftsman. A set of crackers that made use of the flavor of bean, hail, hail, and sheepskin together. Each chopped corn is used, and the texture is good. A handmade rice cracker's shop that lasts for 40 years handles it. Crackers that makes the flavor of Udo. The hail was taking advantage of the flavor of Udo. Udo jelly that makes the flavor of Udo. Super specialties soy sauce, dried bonito, thick seasoning, such as the based mirin synthetic preservatives non-use. Color is thin in the sweet modest, I can take advantage of a variety of dishes. Hit product also enter orders from all over the country. Named after the Tachikawa festival "Hagoromo Nebuta". "flower one wheel" Naka is also excellent fragrant with chestnut sauce containing skin. Across the Udo such as "Tachikawa grew up", also in the wake of trade names souvenir story from local. Baked sweets made with fermented butter producing fragrance and maple giving deepness to sweetness. Pie cloth is crispy and touching light teeth, so many pieces can be eaten. I made nostalgic lemon cake with carefully selected ingredients. We use lemon juice from Tachikawa, and we have ourselves on the taste of overcooked lemon chocolate! And pumped up the natural water of the local underground 100m, use the malt yeast that was carefully selected, yeast without heat treatment is alive. "Nishikunitachi beer cream ale" is refreshing drinking fruity. "Nishikunitachi Beer Amber Ale" is full of fragrant and added malt that was roasted (roasting). Use the honey produced in the Yoshizawa orchard of Tachikawa. Sales also conducted in the city of course packaging and inventory management. Since make the original package from 20, also to the distribution and souvenirs. It is a snack confection in the shape of a person made from domestic rice of attention, fluffy and crispy texture.In the package, Tachikawa's small neta is on it, it is a good for souvenirs. 2012 "Tama gem Contest" award. Fat Aomori prefecture and Hachinohe before off the coast mackerel Fukui Prefecture Wakasa small sea bream that was riding, is a leaf sushi bamboo crisp the Tokyo Udo combination is exquisite bite size. The souvenir of women Very good. Beer "folded want to make the city of beer" from think with, that Asami Tadayoshi's Asami Hotel has developed a central role. It has been commercialized as Tachikawa local beer from that it was popular in the "Manpaku". J: COM Tama and Fujimi original completion of the cooperation of the shopping street of the town. I raised a label design as one item of the Tachikawa proliferation corps. Label is in Tachikawa city Under the supervision of "Kotobukiya", it is a city limited label. There are two types of "Flying cider"and"Red dragonfly cider". 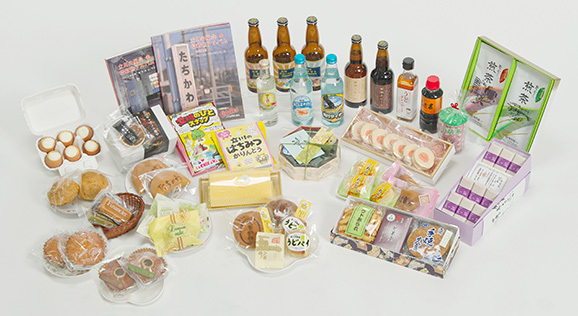 Products that have been developed from the desire of the Suites female staff team hotels represent the Tachikawa. Luxury-to-use in fabrics and fresh cream honey of Ichikawa farm in Ichibancho. Gentle sweetness and moist and texture of the fabric roll of honey, please enjoy the exquisite combination of each other brings out plenty of cream. Fluffy baked in Dacquoise of fabric and Tama of milk "Tokyo Milk" only sugar was sand the milk jam made by boiling down 1 hour carefully. Please enjoy the exquisite harmony of rich milk that spread in the light taste of texture and mouth. While firmly leave the scent of Udo, it brings out the flavor of the ingredients over was, not just salad, is also ideal for meat, fish, stews. Amount：1piece Price：280 yen　※Seasonal limited items will be 320 yen. And mascarpone of the highest quality to be sent directly by air from Italy, we wrapped skin of glutinous the Dainagon who left the chewy. A commitment of the cheese with the luxury, is the original Suites of cheese shop unique. The dear streets which can't be seen in now are being sold at the city bookstore (orion studies) as a photograph collection and a calendar. I have everybody in the city miss, and it's being hoped if you'd also tell Tachikawa's change in posterity. I cooked almonds and caramel on the skin in the middle and baked it crisply. Please enjoy the delicate taste which can only be delivered with leather in the middle. I put pudding in the shell of real eggs using carefully selected materials. Please enjoy a rich taste while small. TeA CoZY custard cream is not yellow. It is a brownish cream color. It is brownish because it is extracted from natural Madagascar vanilla in our unique way without leaving it. Please relish the gentle scented vanilla custard shoes.